This unusual recipe for Crockpot Garlic Brown Sugar Chicken recipe sounds improbable, but try it - you'll love it! And of course the recipe is sweet - there's 3/4 cup of brown sugar in it! Vinegar and lemon lime soda temper the sweetness and add a wonderful tart flavor. You'll need about 10 to 12 cloves of garlic to yield a few tablespoons of minced. You can make this easy recipe with chicken pieces or with frozen or thawed boneless, skinless chicken breasts, or with boneless, skinless chicken thighs. You could also use bone-in chicken breasts or thighs, which will take a bit longer to cook than the boneless variety. The timing of the cooking will change a bit depending on which you select. Aways cook chicken to a final internal temperature of 160°F for food safety reasons. The skin is removed to reduce the fat content of the recipe and also because the texture, when cooked in moist heat, isn't very good. 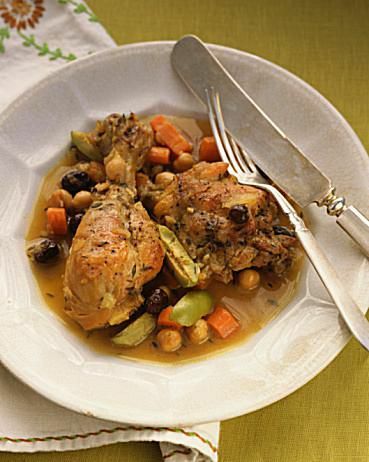 The liquid in this recipe will keep the chicken very moist and tender without the skin. After the food is done, you could thicken the liquid so it's more like a gravy. Remove the chicken and vegetables and keep warm in the oven. Pour the liquid into a saucepan and add a slurry of cornstarch and water. Boil until thickened, then pour over the chicken. You could easily add more vegetables to this recipe. Think about putting the chicken on a bed of sliced onions. Or add some frozen peas or some frozen corn about an hour before the food is done. Serve this wonderful recipe over hot cooked rice or noodles or couscous. All you need for a complete meal is a green salad tossed with tomatoes and mushrooms, and some type of bread. Pat chicken dry and place chicken in the bottom of prepared slow cooker. In a medium bowl, combine brown sugar, vinegar, lemon lime soda, garlic, soy sauce, and pepper, and stir with a wire whisk until combined. Place green bell pepper and carrots on top of chicken. Slowly pour the brown sugar mixture over chicken in crockpot. If you have a newer, hotter cooking crockpot, check bone-in pieces at five hours and check boneless pieces at four hours. Always cook chicken to 160°F and test with a reliable food thermometer. Serve this mixture of chicken and veggies over rice or noodles.